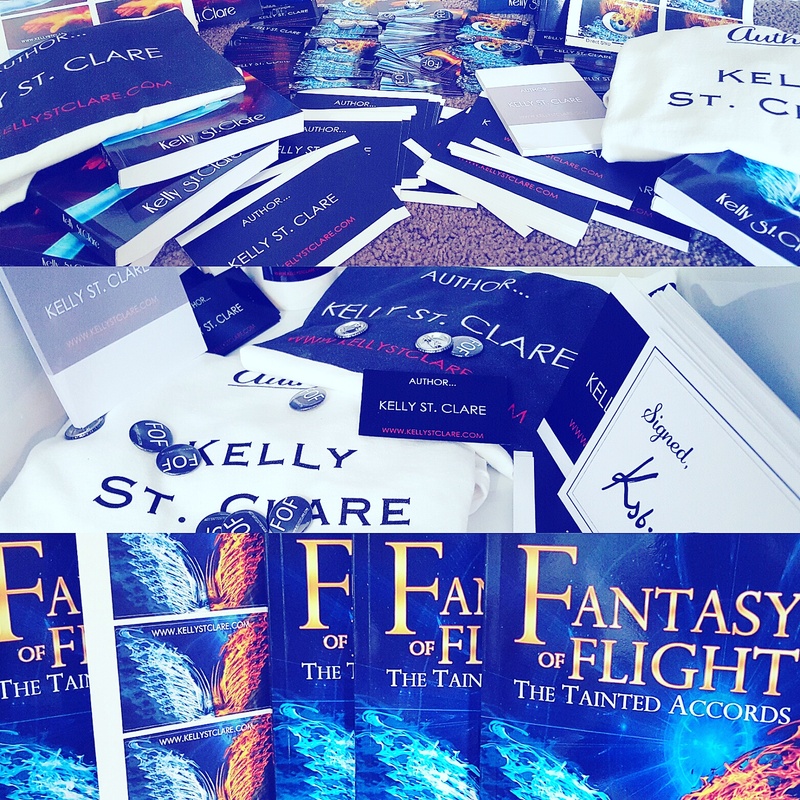 Author merchandise is an established way to market your writing and gain new readers, while rewarding your current following. I recently got my A into G and ordered some book swag. A few merchandise choices were obvious, but a bit of online sifting and a lot of head scratching generated some different ideas! I’m going to share the swaggiest ten book swag options I came across. Then, there will be nothing more to do than to order your very own! As a reader or author you see these popping up all the time. With e-readers taking over, bookmarks have lost much of their practical use – especially with younger readers. But I like to think they’ve gained a vintage feel. Readers collect bookmarks and put them in a special place. Regardless of whether your fans use them or not, bookmarks are an excellent addition to your swag collection. Nothing screams “I’m an Author” quite like them. Plus, they’re easy to post and easy to sign! Note: Bookmarks are one of the most expensive parts of my swag collection. Surprised? This is because you have to buy in BULK. When I say bulk, I mean 1000 + at a time. After researching several options, Harmony Designs proved to have the best value for the lower quantities I was after. You may wish to try them. I have a new love for magnets! I think many authors underestimate the power of magnets. Unlike pens, bookmarks, and ebooks, magnets will be in plain view of every family member and visitor walking through a person’s kitchen- assuming they actually put the magnet on the fridge. Make sure to put your website on the magnet, and voila! Effective advertising. Stickers are not a thing of the past! People will put these on their laptops, e-reader cases, phones, desks, and more. They have a similar effect to magnets where there is potential for high visibility. Make your sticker eye-catching, get that website on board, and hand them out like they’re candy. That’s right. Stickers are cheap, cheap, cheap to make. And cheap, cheap, cheap to send! A traditional part of any Book Swag Kit. Like bookmarks, these are a little more expensive. But I think it looks professional when you whip out your own pen to sign a book. Also, they are easy to keep in the handbag or man-satchel for your fans – unlike stickers and bookmarks which are easily damaged. I got my pens from vista. It’s an Australian site. For those of you from elsewhere source an option with cheaper postage. We’re getting to the big stuff now! I got several different designs of T-shirt made. Some with the titles of my books, some with my name, and some with my website. Personally, I only give away T-shirts in big competitions. Mainly because the smaller items can be sent in envelopes. However, Tee-swag is a big draw for your fans. I view them as the half-way point between the smaller items and signed paperbacks. Plus, you can get some special author t-shirts made to write in. I love mine! This is one I really like. I was scrolling through Thank You cards on a site and played around with the design. There’s several benefits to these, as I see it; easy to post, professional and unique, and cheap to make. Because of the low cost, you’ll be able to distribute these – again – like candy. Signature cards are one of my favorite new toys. Note: These look great fanned out on a display, or on a promotion table at your local library or author event. This is another uncommon book swag item I love. Perhaps here is a good place to mention not all of your swag needs to have your name on it. Adding different prizes to the mix makes your kit look enticing! It doesn’t have to be a pencil case, it could be books from different authors, or many authors give away jewellry. What I like about pencil cases is I can slip in a pen, magnet or other small item which does has my details on it. Similar to T-shirts, these should be a rare giveaway piece. Easy to sign, but not so easy to send. I used my bookcovers as the poster. Simple enough to make if you do it this way. On a side note, these are really nice to have as an author. Get a cheap frame, sign them, and hang them up in your office. You’ll swell with pride every time you look at the wall. They can be good encouragement on days you don’t feel like writing! Readers love print copies. It is fact. If you are only selling e-books at the moment, I’d really encourage you to move into this as well. It doesn’t have to be expensive. In fact, it doesn’t have to cost you anything at all apart from time. I use createspace to make sure my books are available in paperback. This can be linked to your amazon book page so the hard copy is easy to find. You can send a paperback directly to the reader, and/or buy in bulk, having some on hand to sell and give away. Not the time for you? Then offer e-books as a giveaway until you can get the print version up and running. Print copies are a more expensive swag item and you should save them for bigger giveaways. If you create second or third editions of you book, then save a handful of first edition novels for later giveaways. After five or six years, drag these out and run some giveaways. Your readers will love it! Now you have ten ideas to begin your very own swag collection! I believe having book merchandise adds a professionalism to your author image, helping you to distinguish yourself from the millions of other aspiring authors out there. Some ideas which didn’t make the top ten swaggiest included; tradecards, jewellry, wristbands, erasers, cups, notepads, diaries, kindle and ipad covers, canvas bags, calanders, caps, and puzzles (for younger audiences). Try to make your swag unique to specific ideas and parts in your book. For example, arrows are central to my series, The Tainted Accords. I tracked down some arrow necklaces and arrow bracelets for competitions. In addition, I wouldn’t hesistate to infuse your swag kit with personality! What do you like? How could you add a bit of your own style to your merchandise kit? I like tea, cats, and music. Maybe I could give away tea bags with my details printed on the dunking tag. Anything goes! Giveaways draw new readers in and help to generate subscribers. Not only this, but distributing swag is a great way to thank your readers. Good luck with building your swag! And let me know if you find any other awesome kit ideas not mentioned above! If you found this post useful, you may also find my guest post,Taking the PRO out of Procrastinationof interest. You can view my other blogs here.